Do you want to convert format of a font to a different format online without having to install separate software? 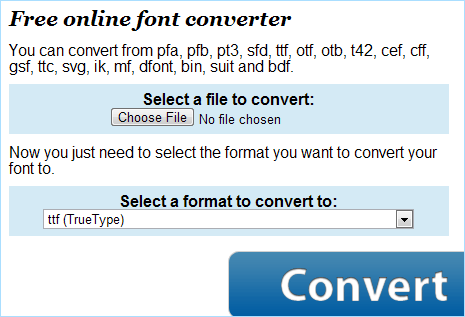 You can easily perform Font format conversion online using free online font format converter tools. These allow you to convert font among different formats like: pfa, pfb, pt3, sfd, ttf, otf, otb, t42, cef, cff, gsf, ttc, svg, ik, mf, dfont, bin, suit and bdf. Free Font Converter is an online font format conversion tool. It allows quick conversion of font formats online in few simple mouse clicks. It works for common font formats including TrueType (.ttf), OpenType (.oft) and PostScript (.ps). It also supports less well known font formats including Suitcase (.suit) and Data Fork (.dfont) fonts. This service can be used on any operating system including: Windows, Mac and Linux. 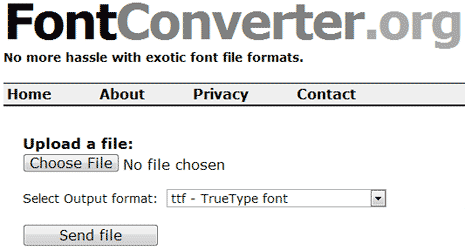 Font Converter online tool allow quick conversion of even an exotic font file formats into common used formats like ttf or otf. To get started, select the font file from your computer and then select the output font format from drop down menu. Click ‘Send File’ button for font format conversion. It supports TrueType, PostScript (Type 1 font), TeX Bitmap Fonts, OTB (X11 bitmap only sfnt), BDF (Glyph Bitmap Distribution Format), FON (Windows), FNT (Windows), OTF OpenType font, SVG, TTC, ABF (Adobe Binary Screen Font), AFM (Adobe Font Metrics File) , BDF (Glyph Bitmap Distribution Format), DFONT (Mac OS X Data Fork Font). Online Font Converter is another free online tool for converting format of fonts. Using this service, you can convert fonts to / from: .dfont .eot .otf .pfb .tfm .pfm .suit .svg .ttf .pfa .bin .pt3 .ps .t42 .cff .afm .ttc .woff and .pdf formats. You can register for free account to track and get notified for font format conversion. You can also send email with the original font and specify final font format for quick format conversion.